We know in Lantana you’re always looking for another great place to eat, so here is one for the books. Verf’s Grill & Tavern in Flower Mound, Texas is celebrating one year of fabulous food! Ever since Verf’s opened in June of last year, it has been thriving in the community because of their diverse menu and everything is made from scratch in the restaurant and served as fresh as it gets! You may know the owner, Jim Verfurth, from his 18 years of owning Village Grill in Highland Village. He decided to close down Village Grill and embarked on his new journey, Verf’s, and we’re loving it in Lantana! Jim’s intention of bringing the joy of family and food to each customer has exceeded expectations from his dedicated and experienced staff to the delicious dishes brought to your table. Verf’s is always creating new dishes to ensure that each visit is memorable and something to look forward to. There is something for everyone here. The grilled lamb chops with rosemary demi-glace served with garlic mashed potatoes and fresh asparagus paired with Charles Smith Velvet Devil Merlot would be my first choice. Or if your go-to is a juicy Kobe steak burger on a fresh baked bun with smoked bacon and Vermont cheddar with a Rhar TX Red, don’t worry they have that too. Did I mention they have 51 beers on tap, cocktails covering mules to margs and quite the wine list? Last but not least, you’ll be sure to finish your meal with a homemade dessert that will really make your taste buds pop like their Jack Daniels chocolate mousse pie. 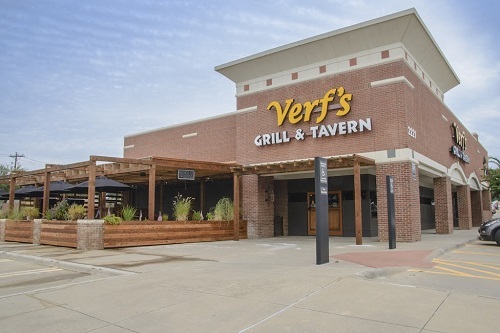 Take your family out for a treat this weekend to Verf’s Grill & Tavern in Flower Mound, just 3.5 miles from our beautiful Lantana. Happy eating!